The euro vs dollar continues to flirt with the 40 day moving average with yesterday’s candle once again balancing on this key technical indicator which is now the final barrier to any further move lower. In yesterday’s trading session the moving average once again came to the rescue with prices holding marginally higher as the session closed as a narrow spread candle. However, as in the last three forex trading sessions each of these candles has exhibited a shadow to the upside suggesting increasingly bearish sentiment as a result. Indeed in early trading today this price pattern has been replicated once again with the 40 day average providing support below but an attempt to rally having fallen back with the euro vs dollar trading at USD1.2859 at time of writing. 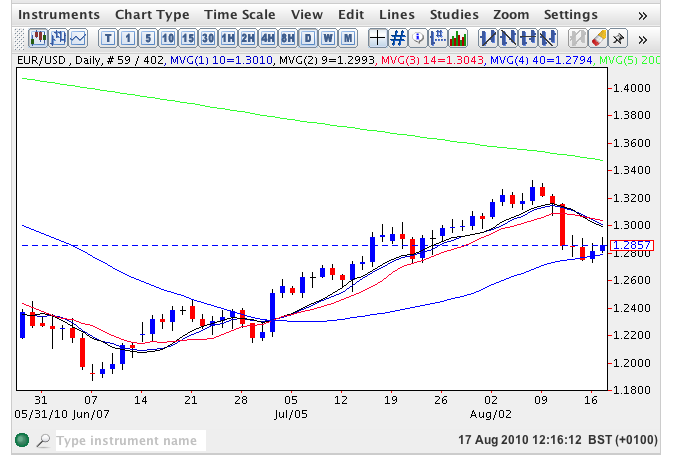 With the 9 and 14 day moving averages now sitting directly above and the 200 day moving average adding further pressure we can expect to see a deeper move lower in due course although USD1.30 may be attained in the short term where prices are likely to run into the 9 day moving average and move back thereafter. With the bear cross signal now in evidence longer term trend traders need to wait for the break below the 40 day moving average which will then signal the resumption of the longer term bearish trend lower. All this week’s fundamental news for the euro vs dollar can be found at my main forex trading site.